Recently, we spent a short vacation with a gang of 7 retirees at Cameron Highlands. As usual, one of our favourite visits was to Cactus Point where we could feast our eyes on the numerous plants on display. My beloved John was cautious about buying plants from Cameron Highlands as most will succumb to their demise in the lowlands of Kuala Lumpur where we reside. However, this particular beauty with variegated foliage really caught my attention. I fell in love with Aechmea gamosepala ‘Lucky Stripe’ the instant I laid my eyes on it. This was the first time we chance upon it. Moreover, the price was just perfect, only RM8.50 and relatively cheap for this gorgeous looking bromeliad with flowering spike that’s as captivating. We have no regrets whatsoever in buying and adding a pot of them to our garden collection. In just 10 days, another flowering spike emerged on one of the matured plants, beautifully resembling the top tip of an asparagus stalk. Wow… what a wonderful surprise, something so utterly unexpected and much welcomed. That wasn’t the end of delightful surprises. 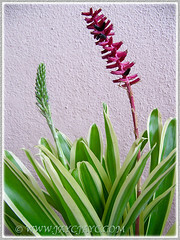 As the flowering stalk unfurled, we got to see why this bromeliad is commonly named Variegated Matchstick Plant. 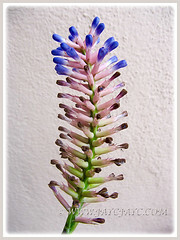 It had matchstick-like flowers of light pink that were tipped with iridescent blue. Absolutely stunning! 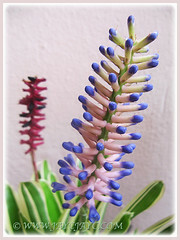 Botanical Name: Aechmea gamosepala ‘Lucky Stripe’. 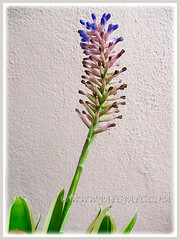 Common Name: Variegated Matchstick Plant/Bromeliad, Variegated Gamos Bromeliad, Variegated Urn Plant. 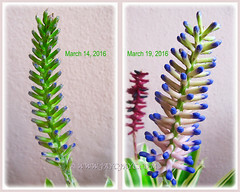 Etymology: The genus name, Aechmea is derived from the Greek word, aichme, meaning the pain of a spear. The species epithet, gamosepala is from the Greek word game0, to marry, and the French word sepale, coined by N.J. de Necker in 1790 based on two Greek words skepe a covering and petalon, a leaf. Origin: It is native to Brazil. 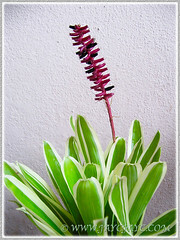 Features: Achmea gamosepala ‘Lucky Stripes’ is from the genus Aechmea that consists of approximately 200 diverse species. ‘Lucky Strip’ is a cultivar with attractive variegated foliage. An evergreen and herbaceous perennial, it has a medium growth rate and clumping growth form. It can reach to about 30 cm tall and spread between 45-60 cm wide. 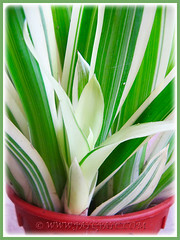 A hardy and erect terrestrial epiphyte with variegated leaves that are medium green in colour, with striking vertical stripes of yellow or cream to white on the edges. Simple ribbon-like leaves are leathery and stiff, overlapping to form a lovely urn-shaped or funnel-shaped rosette. The plant is monocarpic, flowering once in her lifetime and then dies but not before producing many offshoot plants or pups easily to continue her legacy. Achmea gamosepala ‘Lucky Stripe’ produces three-petaled flowers and are borne from branched clusters of floral bracts on terminal spike. The erect inflorescence emerge from the centre of the rosette of leaves and usually rises way above the variegated foliage, about twice its height or more. The flowers are variable in colour, with bracts ranging from different shades of pink and red to maroon, and tipped with petals from bluish purple and mauve to iridescent blue, giving a matchstick-like presentation. They will be followed by berry-like fruits. Culture (Care): Achmea gamosepala ‘Lucky Stripe’ or Variegated Matchstick Bromeliad as commonly named, grows easily with least maintenance. Light: It prefers partial sun though best with morning sun or bright light. Can tolerate light to partial shade. Avoid direct sunlight that can scorch its foliage. Moisture: Moderate water needs. Water regularly as it needs constantly moist soils. It’s okay to allow water to sit inside the cup of the plant though it has to be flushed regularly to prevent stagnation. Soil: Grow in humus-enriched, sandy/loamy and well-drained soil. Others: Remove withered or sunburnt leaves to keep it aesthetically attractive. Deadhead to encourage production of offsets or pups by mother plants. The urn-shaped rosette may lead to mosquito breeding. Thus, flush out the urns regularly with a garden hose to displace the larvae and detritus, if any, as well as to prevent buildup of mineral salts and to replace the trapped stale water. Feed once monthly with a balanced liquid fertiliser. No known serious pests or disease. For subtropical and temperate regions: Hardiness: USDA Zone 9b-11. It can tolerate mild frosts. An eye-catchy evergreen shrub to plant in tropical and subtropical regions. 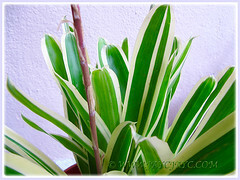 Provide sufficient sunlight outdoors and bright light if grown indoors as houseplant. Water moderately from spring to autumn but keep fairly dry in winter. It flowers from early spring to summer in good growing conditions. Propagation: By division or by separating offsets or pups that are produced from flowering mother plants. 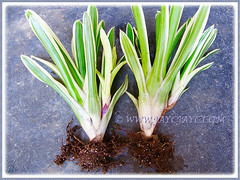 Using a sharp knife, gently remove the pups with/without attached roots from the mother plant to propagate them as new plants. 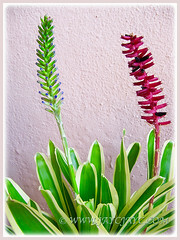 Learn more about how to propagate bromeliad pups here. Usage: Aechmea gamosepala ‘Lucky Stripe’ or Variegated Matchstick Bromeliad is an excellent ornamental garden specimen with its stunning variegated foliage. Suitable too for container planting. An exotic looking tropical bromeliad to be planted in a garden bed or border to brighten shady areas. 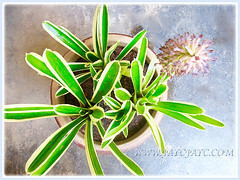 Great as a houseplant for indoor decor or located at patio and deck, outdoors. 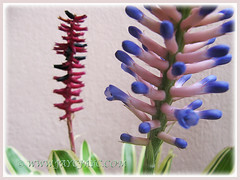 Their gorgeous flowering spikes can be used as cut flowers since blooms are quite long-lasting. 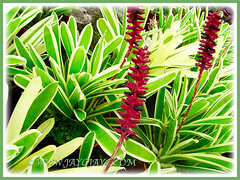 Since these variegated bromeliads are compact and sucker easily and quickly, they will be most ideal as ground cover plants. Moreover, they are herbaceous evergreen plants and require least maintenance. It is ideal too to be planted amongst drought-tolerant plants in a rockery to add structure and interest to your garden. All your beautiful garden as always, this plant is new to me, extraordinarily beautiful. Thank you, Yara. Indeed, it’s absolutely gorgeous! I think an easier way is to link this post to your Facebook group. Have a lovely day and a great weekend ahead. Hugs.